This brings an interesting point on using wait and notify mechanism, a call to notify() happens, when thread changed state of shared object i.e. in this case producer change bucket from empty to not empty, and consumer change state from non-empty to empty. Also wait and notify method must be called from synchronized context, wondering why, read this link for some reasons which makes sense. Another important thing to keep in mind while calling them is, using loop to check conditions instead of if block. This is really tricky for beginners, which often don't understand difference and wonders why wait and notify get called form loops. Joshua Bloch has a very informative item on his book Effective Java, I strongly suggest reading that. In short, a waiting thread may woke up, without any change in it's waiting condition due to spurious wake up. For example, if a consumer thread, which is waiting because shared queue is empty, gets wake up due to a false alarm and try to get something from queue without further checking whether queue is empty or not than unexpected result is possible. We have a shared Queue and two threads called Producer and Consumer. Producer thread puts number into shared queue and Consumer thread consumes numbers from shared bucket. Condition is that once an item is produced, consumer thread has to be notified and similarly after consumption producer thread needs to be notified. This inter thread communication is achieved using wait and notify method. Remember wait and notify method is defined in object class, and they are must be called inside synchronized block. That's all on this simple example of Inter thread communication in Java using wait and notify method. You can see that both Producer and Consumer threads are communicating with each other and sharing data using shared Queue, Producer notifies consumer when there is an item ready for consumption and Consumer thread tells Producer once it's done with consuming. This is classical example of Producer Consumer design pattern as well, which inherently involves inter-thread communication and data sharing between threads in Java. Is it same for all JDK versions ? I had to add to the queues but for the most part yes. The log4j dependency is annoying... Just control-f "logger.debug" and replace with "System.out.println"
@Anonymous, Yes, Wait and notify method are available from JDK 1.5 so above code of inter thread communicaiton will work on all JDK versions. This code returns different results on different runs. Also it is interesting when you add multiple Consumer classes...try it out. Do we really need while loon inside synscronized context? I think 'If' will suffice here. Anyways top loop is for loop, so it's definitely run until 4 elements are produced/consumed. Once 'Producing 0' is printed and line sharedQ.notify() is executed in producer synchronized block, how come Producer synchronized block again acquires the lock on sharedQ and prints 'Queue is full, waiting'. 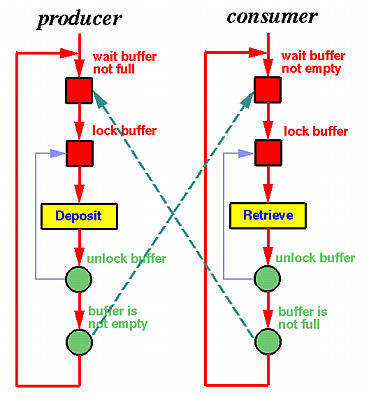 As per my understanding, as soon as notify() is trigerred control should come to waiting thread(in this consumer thread) for acquiring lock on same object. But rather Ouput is: 'Producing 0', then 'Queue is full, waiting' and then comes 'Consuming 0'. Same is applicable when Concumer thread triggers sharedQ.notify() how come line 'Queue is empty, waiting' line is getting printed? what happen when your waiting thread in withdraw wake up prematurely and not because of deposit notify it. To put it another way, a thread may wake up from wait() for no reason at all - with no notify(0 or notifyAll(). So you should always have a loop to check whether whatever-thing-you're-waiting-for has actually occurred yet or not, and if not, resume the wait(). I am still confusing on wait and notify usage. What will happen if we call notify, when there is no thread in waiting state. => when I try to run ThreadA as java application, in few cases I am seeing java execution is not terminating. and in few cases java execution is terminating. for java execution not terminating cases::and looks fine for me. Q)but I am expecting execution should not terminate in below case:?????? Q).could you answer why execution is terminating, actually as per console log it should not terminate right???? Hello @Unknown, the reason is that you cannot control which thread will start first and will continue execution until you call wait() or notify(). It's up to Thread scheduler in Java to choose a thread to start, it can sometime Start Thread A first, finish it execution and the start B, in that case you see the expected result. But if it starts Thread B first and Thread A later then Thread A will call wait() and stuck their forever because notify() has already been called and there is no more thread to call notify, hence you see the execution not terminating. Also, wait() should be conditional, you must also check the condition once you wake up e.g. wait if buffer is full.